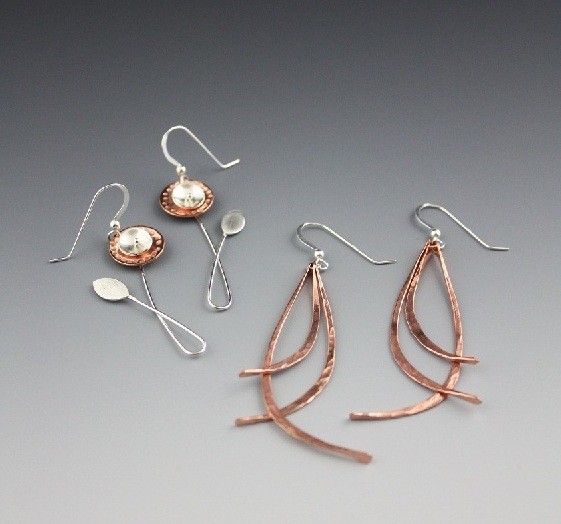 L: 'two-tone flowers', sterling silver + copper, R: 'allure', sterling silver + copper. Hi....my passion is making beautiful things out of metal and stones! I am constantly looking for inspiration in all of my surroundings whether man-made or natural. I try not just to 'look' but to really 'see' and then to translate that into a simple but truly unique design. I hope that you will enjoy finding out more about my jewelry and a little about me too. Don't forget to take a look at my shop online page and blog for more pictures and info. Visit my blog page for all the latest news and don't forget to leave a comment! Spring 2019 is almost here! I've updated my spring and summer show schedule (check my events page) and I hope to see you at one (or more!) of them! If you can't make it, my online shop has many jewelry designs available for purchase. ​Please visit my events page for more show info. In the meantime, please feel free to contact me anytime. Looking forward to this year's shows! As always you can purchase SuStudio Jewelry by visiting my shop online page, contacting me directly at 916-208-8001, or emailing me at info@sustudiojewelry.com anytime. I'd love to help! To see some of my new handmade sterling silver (and/or mixed metal) designs, take a look at my shop online page for more pictures or purchase. 'Swirls', necklace, sterling silver + chinese turquoise.